The measuring of the yarn spun during Spinzilla spinning week began Sunday evening, with the measuring of the yarn of the 5 Independencia based spinners and 2 Huancarani spinners. 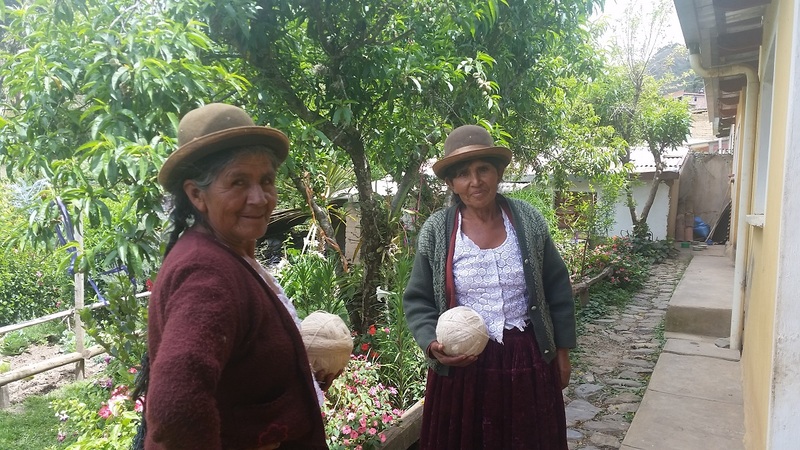 Doña Julia and Doña Antonia had traveled from Huancarani in the back of a cargo truck on Saturday to sell their potatoes at Sunday´s market. Late Sunday morning they dropped by the PAZA store/workshop to leave their balls of yarn for measuring and asked if PAZA would buy it. Doña Julia said she had plenty of spun yarn to weave her next project, a poncho for her son, and the sales of her potatoes wasn´t going well. She was going to lower the already low price of the potatoes from $2.15 to $1.45 per 25 pounds in hopes of selling out in time to catch the truck back to Huancarani. PAZA purchased the yarn at $10 a kilo, which is double the local price. The yarn is dyed on Club de Artesanas dye days (local plants and cochineal) and sold to the weavers. Twenty-eight cents is added to the cost of the yarn per skein for the dyeing. 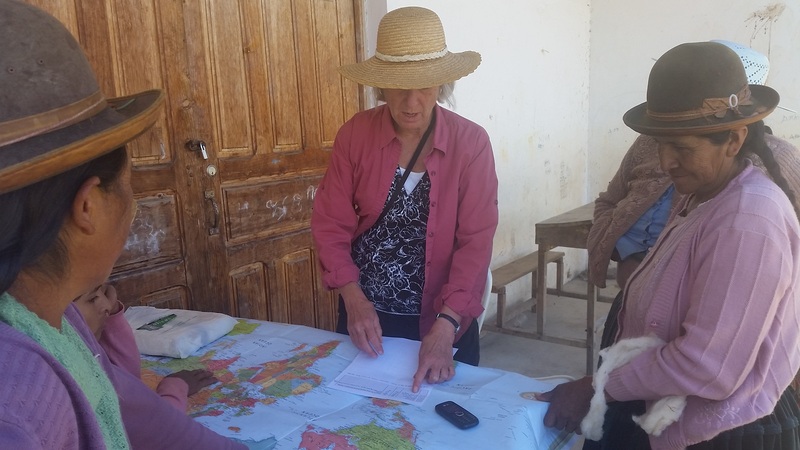 Doña Máxima did an excellent job of arranging transportation and planning for the measuring with the spinners in the communities of Huancarani and Sanipaya. 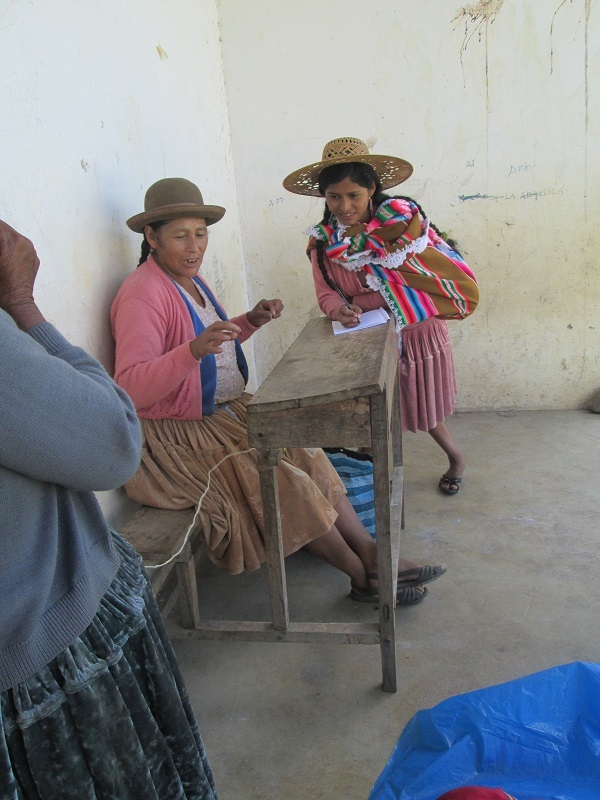 She, Doña Antonia, Dorinda, and volunteer Shelby made up the measuring team. The back of the contracted pickup truck was loaded with a wooden table with measurement marks, plastic chairs, low wooden stools, plastic buckets for holding the balls of yarn being measured, and beverages for all. The measuring for 11 spinners took place on the porch of the church and a pew was used as a 3rd measuring station. 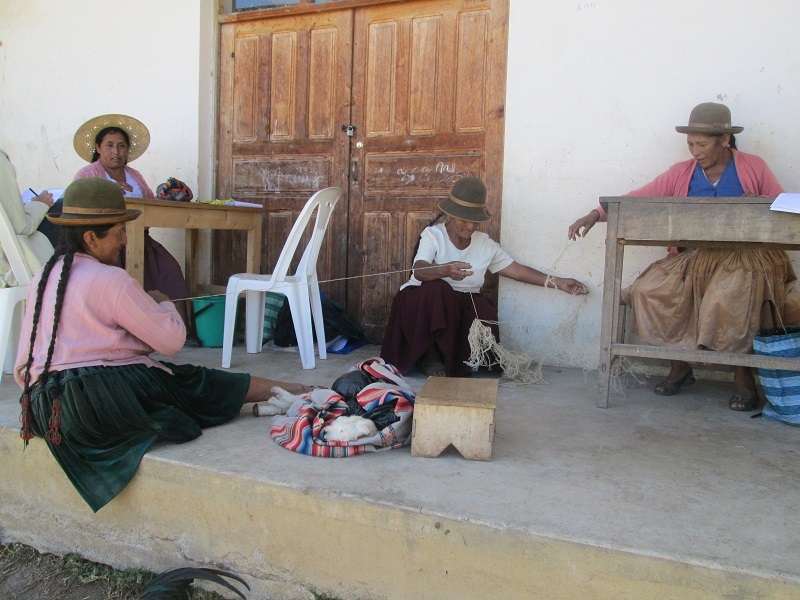 Each spinner rewound their yarn into a ball as it was passed by the woman measuring who called out “cinco” or “marca” to the recorder after every 5 yards measured. Maribel, who was in PAZA´s Club de Artesanas before moving to Huancarani arrived with her baby and sister-in-law to lend a hand with the recording. Spinners who arrived early ceded their place to those who arrived later but had left unattended sheep or goat herds nearby. Those who could linger did so enjoying the opportunity to socialize. The measuring began at 9:30am, and the measuring team was homebound at 2:30, having taken time out for 2 lunches provided by the spinners. 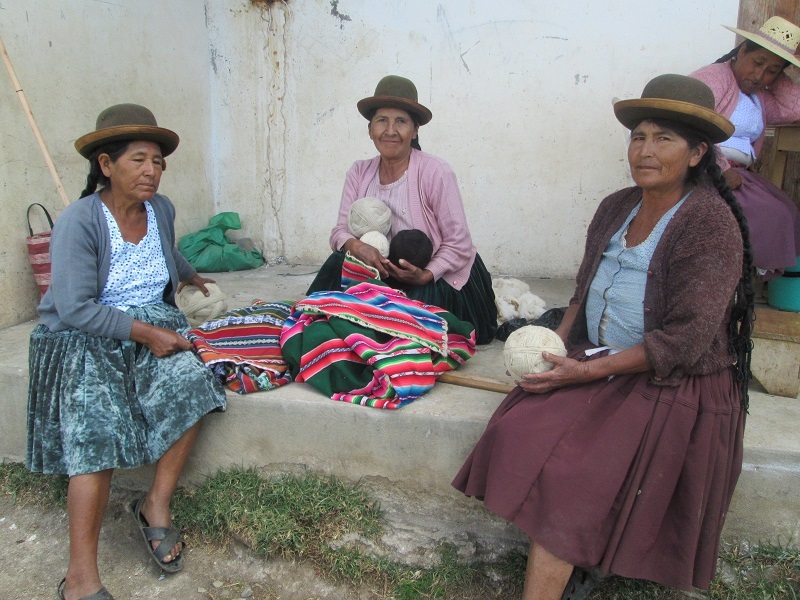 Doña Eulalia and Doña Narciza both have goat herds, so they were queried about where they had purchased their fleece. They said that traders pass through and trade sheepskins for dried corn kernels. Doña Justina said she´d traded for a black sheep skin and divided the fleece with Doña Casimira. The sheep skin cost each woman 25 pounds of corn kernels. 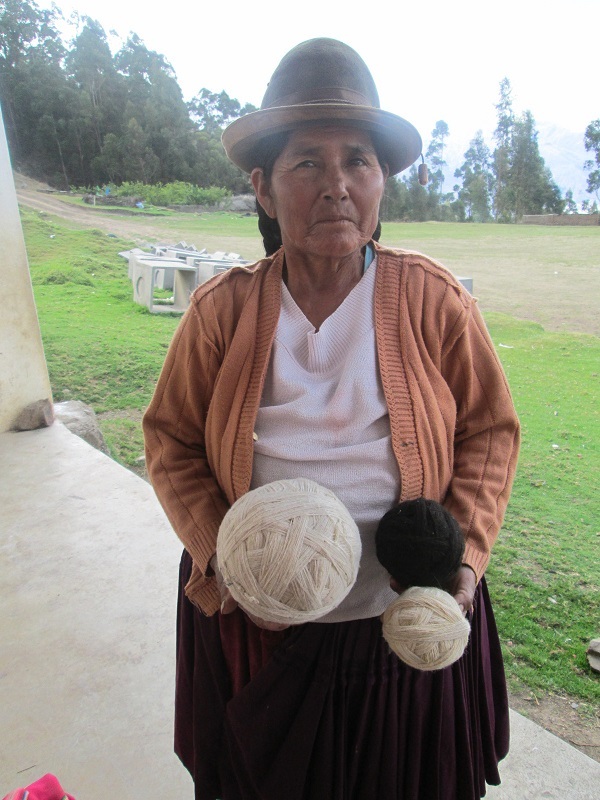 Doña Justina said she filled 11 drop spindles with spun yarn from her half. Doña Casimira spun 4,680 yards and was the top ranking spinner in this year´s contest. She is twice widowed and her 4 children have migrated. Last year she tried to live in the tropical area of the state of Cochabamba with her daughter, but that didn´t last long. She doesn´t have any livestock and is between sowing and harvesting on her land. Her spinning was fine and care had to be taken not to break a strand while measuring her heaviest ball. All but 1 of the Independencia based spinners ranked low on the team. Doña Paulina spends long hours each day selling vegetables in the Independencia market. There isn´t much activity during the week, so she was probably glad to pass the day spinning. Doña Máxima´s daughter Vilma, at age 26 and mother of 4, was the youngest of the spinners. She learned to spin as a girl when the family lived in Huancarani. Doña Máxima was pleased and surprised that Vilma´s spinning was not as she remembered, but fine and consistent. Vilma is one of the top producing PAZA weavers, and usually purchases skeins through PAZA. Time for hand spinning is harder to fit into the town lifestyle. Doña Máxima, the team captain, was disappointed in her yardage total which was lower than in 2014, but happier with the quality. Great story and writing! I posted ony CC FB page.